Contact lenses receive a lot of flak from non-contact wearers. In fact, there are so many myths surrounding lenses that most people pass up on contacts when they are a perfectly safe option. If you’re in the market looking for lenses or trying to decide between glasses and lenses, this article will definitely clear all your doubts up. People with varying eye conditions that are less common than say myopia often think contacts are not for them. That is, without a doubt, untrue. Whether you have presbyopia, astigmatism, or something else – contact lenses can correct even the most challenging conditions. This is also not true. Your eye is covered by a thin membrane called conjunctiva that makes it impossible for lenses to be lost behind your eye. If your optometrist prescribes corrective contact lensesto you, then indeed it is to help with your vision. A corrective contact lens is designed to make your vision 20/20. But to say lenses are only meant to improve vision would be wrong. Lenses can also be worn for purely aesthetic purposes, for instance, to change the color of your eye. Colored contact lens like freshlook lens helps you achieve this. There are many colored lenses out there ranging from ones that just add a touch of color to ones that are completely opaque. It isn’t wearing contacts that make your eyes dry or uncomfortable but the irregular use of the contact lens cleaning solution that can make it so. If you are not wearing daily disposables, then you must clean your lenses religiously and never wear them for far too long. Daily lenses require no maintenance whatsoever while monthly and weekly lenses only need to be cleaned regularly the same way your eyeglasses would have to be every day. While it is true that contact lenses can get stuck in your eye, it is possible to take them out at home or at the hospital. 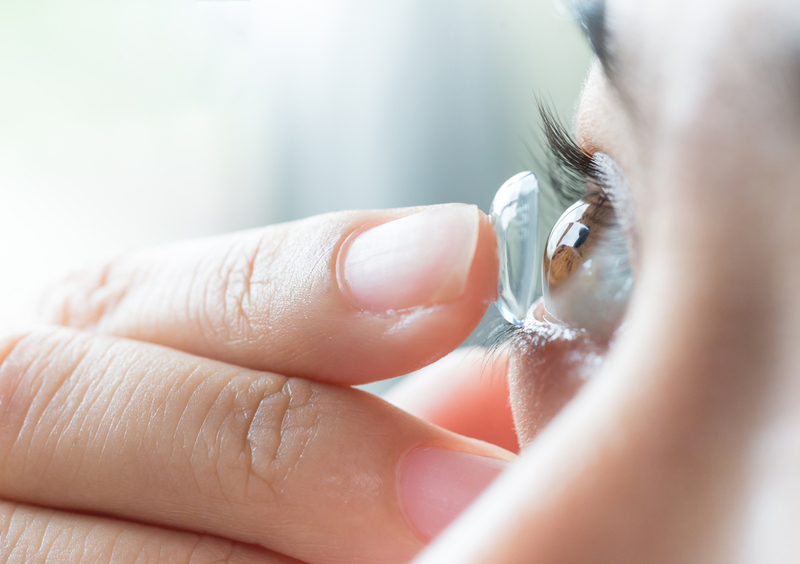 Contact lenses can get stuck if you wear them for too long or wear them to bed. By taking the right precautions, it is definitely possible to avoid such a circumstance. It is true that it can take a little bit of practice to get contacts in your eye but your doctor will make sure that you know the right way to wear contacts before you have to start doing it on your own. This might be a concern especially with people leading active lives but contacts are made to fit close to the eye and it is very rare for it pop out without intervention. Apart from all these myths, people also believe that contacts are way too expensive. That isn’t true either. Affordable contacts are available since there are so many local brands available. Just make sure to discuss all your fears and trepidations with your doctor before you decide on what kind of contact lenses you should get.